Unlocking insights from data helps FIs understand, anticipate and offer account holders the products and services they truly need. Using machine learning, FIs can surface the behavioral intelligence buried in the large amount of account holder transactional data captured each day. 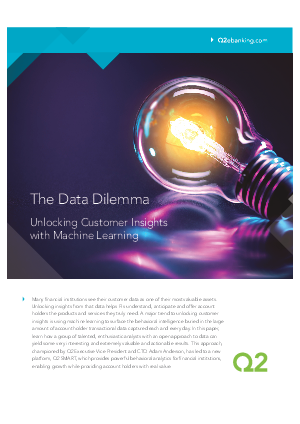 In this paper, read about Q2’s approach to machine learning and how it led to Q2 SMART, which provides powerful behavioral analytics for FIs, enabling growth while providing account holders with real value.